The biggest of all fruit borne on a tree is the mighty jackfruit, some fruits grow to 30kg or more, with each tree able to produce 100 to 200 fruit a year! A native to South India (Artocarpus Heterophyllus) a relative to the Fig, Mulberry and Breadfruit. The is quite and incredible fruit, known as a multiple fruit which is made up of hundreds of thousands of ind...ividual flowers and it's the fleshy petals known as 'avrils' that you eat and the seeds. So the question is what do you do with a 30kg fruit? There are heaps of options and ways of eating this giant of a fruit. First when the fruit is unripe or green, it is used widely through out Asia in curries, as the flesh has meat like consistency. When staying at Wildwood it is great to pop down to Mason's Café for a delicious BBQ pulled Jackfruit burger.... it's a vegans dream! When the fruit is ripe the flavour is vagley similar to a sweet bubble gum/mango/banana. Here at Cape Trib Exotic Fruit farm we like to dry the sweet flesh to make a healthy snack that last for ages. Or make a Jackfruit honey that is great for baking or pancakes. The seeds can also be boiled and roasted and taste great a bit like roasted chestnuts. Here at Cape Trib Exotic Fruit Farm, we love to grow fruits from all over the world. But it is extra special to grow a native fruit from our part of the world. The Davidson Plum that is also called the Ooray. There are 3 species in this genus and we grow the Davidsonia pruriens. Having been a foraged fruit by the traditional owners of the Daintree area the ...Kuku Yalanji, it is now a widely sort after bush food that chiefs from all over Australia are turning into jams, sauces, chutneys and wines. The plum it's self is a rich purple/blue colour with a beautiful reddish/ pink flesh. The flavour is very sour, but that is why it works so well made into jams etc. These trees are native to the jungle that surrounds Wildwood and once you get to recognising the tree you will spot a few on walks through the jungle. We harvest the fruits when they have fallen on the ground as long as the Cockatoos stick to there side of the bargin to not to eat them all before they are ripe. It's hard to know where to start with one of our favourites at Cape Trib Exotic Fruit Farm, it's the one the only Rollinia Deliciosa, the name says it all! The large yellow fruit has soft spines with a creamy white flesh with black seeds, and it truley is a taste sensation with the fruit tasting of creamy lemon sherbet and lemon meringue pie. The best way to eat it is with a spoon, or as we like to do is just dive in face first and worry about the mess later! The large yellow fruit has a bumpy surface and soft spines. The Rollinia is in the custard-apple family, Annonaceae, that is native to tropical South America. We have 8 of these amazing trees that can grow to 15 meters and can produce fruit from seed within 3 years. Most years we will feast on Rollina over a 4 to 5 month period. The fruit is very delicate and only has a short shelf life of a week or so. Therefore to try this delectable fruit you will have to come and visit us as it does not travel well! 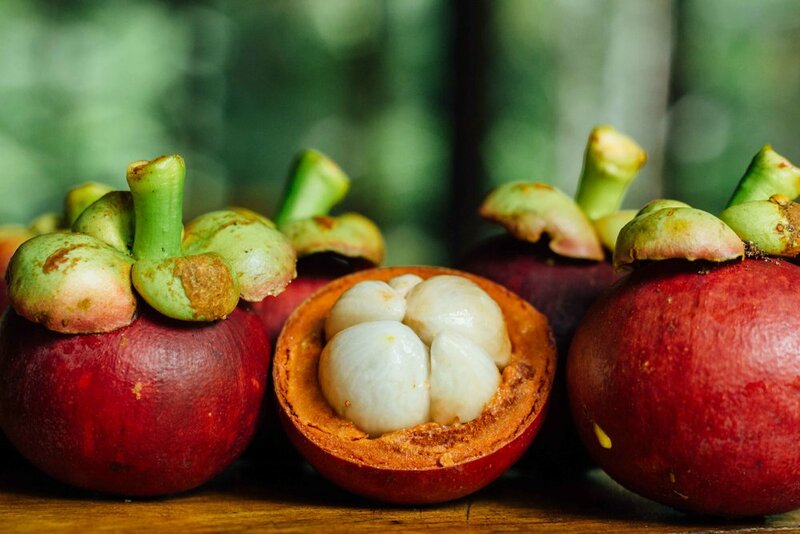 We’ve had a busy and exciting few months celebrating our latest mangosteen harvest, with over 70,000 fruit handpicked, hand polished, lovingly packed and sent off to the markets. They went down a storm in Brisbane and Sydney and we sold out within hours of them arriving at the markets. Our guests loved sampling them, as did most of the visitors to Cape Trib in May and June. We even had a few guests keen to roll up their sleeves and get stuck in to picking. The fruit of the week is the MATISIA! Matisia (Matisia cordata) which is also called Chupa-Chupa is native to the foothills of the Andes, and is common throughout parts of Brazil, Venezuela, and Colombia. The fruit is round with a greenish leathery skin and sweet orange-yellow pulp which is quite high in fibre. Some people say it tastes a bit like rock melon! It is usually eaten straight out of hand but delicious in juices too! At Wildwood it's easy to find beauty even on rainy days. Wildwood accommodations are set on the Cape Trib Exotic Fruit Farm in the Daintree Rainforest, very close to the Ocean and the Great Barrier Reef. As a starting point it doesn’t seem so bad does it? It’s actually even better than you think! As a guest here you get to enjoy the fun activities and excursions that Cape Tribulation and the rest of the area have to offer, but what is really incredible for me is the time spent on the property. It’s the perfect environment to relax, eat juicy exotic fruit whilst reading a book and most of all get creative! Doesn’t matter if it’s pouring down with rain or the strong Australian sun is shining, sitting on the veranda with no internet connection, being encapsulated in the rainforest, brings you back to when you were a child and all you had was pen an paper and what you could find in your backyard. A few of the recent guests have left us some beautiful art as a testimony of that! This one was made with pieces found on the ground around the orchard, some black beans, black bean pods, quandongs, leaves, tree bark and much more to create an incredibly detailed visual dish filled with texture and color, which represents perfectly the vibrant rainforest! Thank you Avrille and Hayden, we absolutely loved it! Photo by Diana Scalfati, Art by Avrille. Have you ever heard of the Abiu? It's scientific name is Pouteria caimito and it's originally from South America. Its fruits shape varies from round to oval with a point. When ripe, it has smooth bright yellow skin and has one to four ovate seeds. The inside of the fruit is translucent and white. It has a creamy and jelly-like texture. The fruit has a sweet, mild taste which may have a hint of pineapple but is best described as reminiscent of caramel flan. It is often used in ice cream or eaten out of hand. YUM! Every week we are going to be writing about one of the incredible fruits you can find here at Cape Trib Exotic Fruit Farm / Wildwood, so keep your eyes peeled!